A historical transboundary water management dispute between Central Asian countries; a dam built in the Naryn River in the late 1970s flooded 26,000 ha of land and archeological sites. Further dams are planned. The Toktogul Dam in Kyrgyzstan was built on the Naryn River (a northern tributary of the Syr Darya) during the 1970s as a centre piece of the Soviet Union’s efforts to conquer nature in its drive to modernise central Asia; the dam was finished in 1973, the reservoir created in 1976, and served to control the inter-annual variability of water resources and to ensure that there would always be sufficient water for irrigation. The reservoir flooded more than 26 thousand hectares of land in the Kementub Valley, of which 21.2 thousand hectares of agricultural land, 26 communities including large settlement Toktogul were displaced and the main road through the region was re-routed. Archaeologists excavated sites dating back as far as the 8th century AD before they were lost. According to Eelke Kraak, researcher at University of Oxford , “For Soviet planners, dams were symbols of development and modernisation. 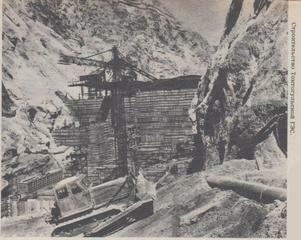 The Soviet Union’s hydraulic mission was to conquer nature by transforming free flowing rivers into an economic resource. In absence of democracy, dams were also an important source of legitimacy for the Soviet Union. On average, the region has enough water to grow sufficient crops to feed its own population and earn foreign currency through exports. The problem, rather, is a huge geographic, seasonal and inter-annual variability in water availability. 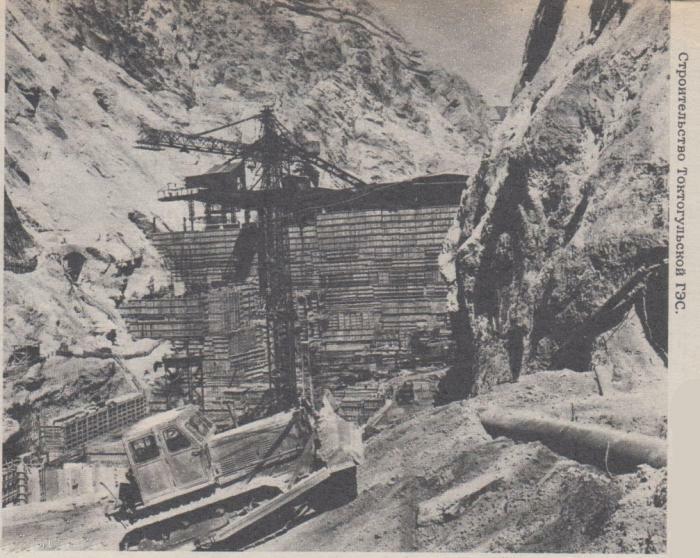 In response, between 1950 and 1990, the Soviet Union built hundreds of dams, canals and artificial lakes. Uzbekistan’s Hunger Steppe was transformed from an uninhabited desert into a cotton factory of 300,000 hectares. The Kara Kum Canal, when completed in 1988, transferred 12.9 cubic kilometres of water – almost 15% of the Amu Darya River – to irrigate parts of the Kara Kum Desert.”  The Toktogul dam became fully operational in the late 1980s. It is one component of a cascade of five hydroelectric stations downstream, which all together produce 90% of Kyrgyzstan’s power. As the dam regulates transboundary water flows, it has caused several frictions among Central Asian countries. 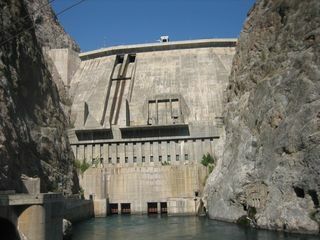 The Toktogul dam has today multiple functions: it is both the main supplier of water for downstream irrigation, and the main source of electricity for Kyrgyzstan. Eelke Kraak explains that “The trouble is that Kyrgyzstan wants to discharge water from the reservoir in winter to generate electricity, while Uzbekistan and Kazakhstan prefer to discharge water in summer, when they need it for irrigation. In the past, Kyrgyzstan released water from the reservoir in the summer, in return for gas and oil from Uzbekistan and Kazakhstan. But this exchange of resources collapsed when the Soviet Union broke down in 1991. Disputes over the timing of water discharge have brought the two countries to the brink of conflict.” However, the costs have been high. The Aral Sea, the terminal lake of the main sources of water in central Asia, the Syr Darya and Amu Darya rivers, has shrunk importantly. Damming and diverting the Syr Darya and Amu Darya Rivers radically decreased inflow into the Aral Sea; today only 10% of its 1960 volume remains. The consequences have been dire: salinisation, polluted dust storms and a grim economic outlook for those living around the lake. Life expectancy for people in this region has dropped to 50 years and Karakalpakstan, an area south of the lake, now has one of the highest incidences of tuberculosis in the world. When the Soviet Union broke up in 1991, a number of institutions were founded to manage the region’s water, including the International Fund for Saving the Aral Sea and the Interstate Committee for Water Coordination. They were expected to work together with the regional governments to address the environmental problems, but little has been done to alleviate the water problems of central Asia over the last 20 years, and many areas surrounding what is left of the lake are also heavily polluted. In the summers of 2008 and 2009, mismanagement of the Toktogul Dam led to water shortages in Uzbekistan and Kazakhstan, as well as lengthy power cuts in Kyrgyzstan” . Water and energy management is a highly contentious issue in the region, as the ousting of President Kurmanbek Bakiyev in April 2010 shows, as the situation can be even exacerbated by climate change consequences. The rapid melting of glaciers that feed central Asian rivers, for example, suggests that the countries cannot count on this level of water supply indefinitely. More water is predicted to flow into the basin over the next 20 years, but to decline rapidly and unprecedentedly after that. Kraak further explains that “disagreements over the management of Toktogul and other water problems remain unresolved. There are two key reasons for this. First, control over water resources is still tightly linked to the legitimacy of the political elites. Timothy Mitchell, an American political scientist, proposed in his book Rule of Experts that “large dams [offer] a way to build not just irrigation and power systems, but nation-states themselves.” Indeed, the dams and water management systems of central Asia became key to the nation-building task its countries faced after 1991. The massive irrigation network in the desert areas of Uzbekistan is a source of pride for the country. The fact that the Toktogul provides most of the Kyrgyzstan’s electricity production is too. Unfortunately, these goals of water management contradict each other. Second, the two countries disagree about what water is. Kyrgyzstan adopted a set of laws in 2001, classifying water as a commodity like oil and gas. This could potentially mean that downstream Uzbekistan and Kazakhstan would have to pay for the storage costs and maintenance of reservoirs, if not for the water itself. Uzbekistan, on the other hand, officially considers water a free, public good. It also argues that water comes from God, and can therefore not be traded. In reality, Uzbekistan objects to those laws because it does not want to pay Kyrgyzstan for water. 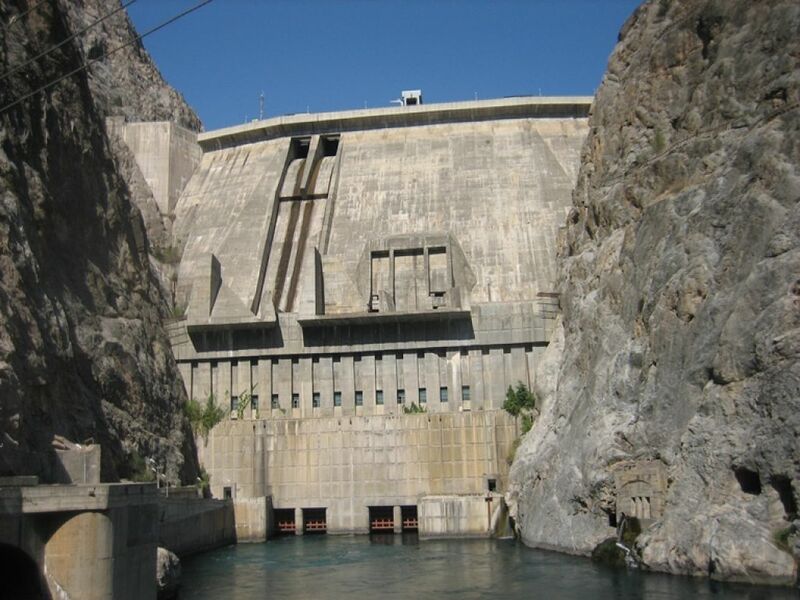 Fundamental disagreements over whether water is a tradable commodity, and the fact that regional hydro-politics is linked with domestic power struggles, have prevented sustainable cooperation.”  Toktogul Reservoir reached a critical state with regard to water level within the dam in 2009. The presidents of Kazakhstan and Uzbekistan proposed then the resurrection of an old Soviet solution to central Asia’s water issues: to divert water from the Siberian Yenisei and Ob rivers to the Aral Sea and the wider region. According to Kraak, the plan is financially unviable, and unlikely to be carried out. And further comments that “Grand engineering schemes may provide legitimacy to unpopular regimes, but they fail to account for the fundamental political nature of water. Water management requires a political, not a technical solution” . In Sept 2016, the ADB signed an agreement for rehabilitating the old and obsolete infrastructure of the dam complex, under the direction of the company Joint Stock Company Electric Power Plants . Project Details Toktogul Dam is a hydroelectric and irrigation dam on the Naryn River in the Jalal-Abad Province of Kyrgyzstan. It is concrete gravity dam with height of 215 metres (705 ft) and length of 292.5 metres (960 ft). It is a part of the Naryn-Syr Darya cascade. It is named after Toktogul Satilganov. The reservoir has total capacity of 19.5 cubic kilometres (15,800,000 acre·ft), of which 14 cubic kilometres (11,000,000 acre·ft) is active capacity. Its length is 65 kilometres (40 mi) and its surface area is 284.3 square kilometres (109.8 sq mi). The maximal depth of the reservoir is 120 metres (390 ft). Why? Explain briefly. This is an historical case of water management dispute. Few records are available on people's mobilization at the time of displacement and how the issue was addressed in the '70s. Wooden, Amanda E. "Kyrgyzstan's dark ages: framing and the 2010 hydroelectric revolution." Central Asian Survey 33.4 (2014): 463-481. Irrigation in the countries of the former Soviet Union in figures. FAO. 1997. p. 128. ISBN 978-92-5-104071-3. Other Comments Some observers have remarked on the difference between the strong civil society opposition to the Kumtor gold mine (owned by a Canadian company) and the internal acquiescence to the dams in the Naryn River (built by Russians, and now by the Asian Development Bank). The conflict here is with neighbouring states.